The tragic shooting in France does not make all Moslems evil no more than a UVF shooting or the antics of the Orange Order makes all Protestants evil. Those who say it does are the extremists. 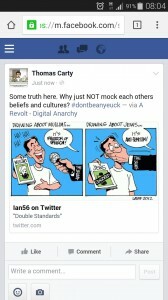 Why just refuse to mock each others religions? A little respect goes a long way. Ulster and North Leinster has a dialect word: “Nyeuck”. Like quack its not a real work but an imitation of the sound it describes. In this instance it is a suppressed snigger of a good for nothing that makes laughs at others expense. Its the only way they can make themselves seem funny. Thats the level of satire the Charlie magazine was at. It does not mean they should have been shot. That is terrorism. But its not an attack on my freedom of speech. 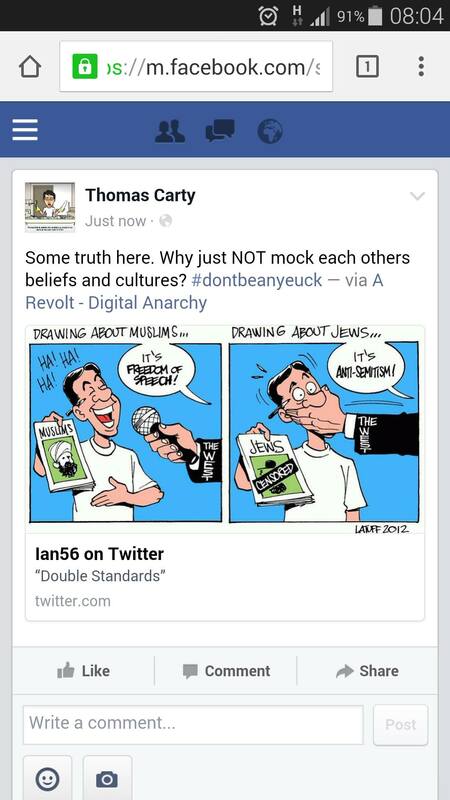 As the screengrab below shows if it was a gag against Judaism and not Islam it wouls be a different media reaction. Comics and comedians… dont be a nyeuck. Show a little respect.